Run 26.2 miles in a single run. You've spent the last few months preparing for this. You've done the workouts. You've completed the half marathon and twenty mile long run. Now it's time for the main event! 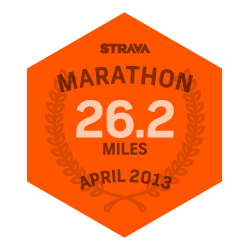 Strava is challenging you to run 26.2 miles in a single run, on any day between April 6th-28th. Whether you're registered for an event like Boston or starting from your driveway, lace up those shoes and show what you're made of! Successfully complete all three Challenges in the Marathon Training Series and you can expect proper recognition of your efforts from Strava (and maybe a little surprise as well). In addition, we want to see a photo from you on the big day. Once you cross the finish line or complete your run, pose for a photo and show us your finisher face. 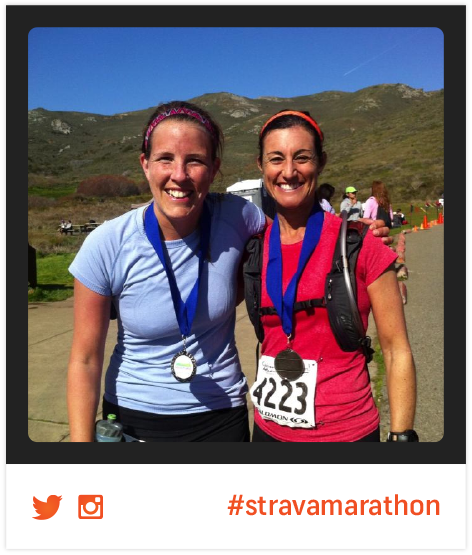 Share it on Instagram or Twitter with #stravamarathon and we'll reward our favorite submissions with Strava gear. 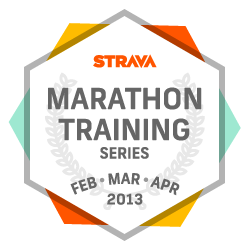 Successfully complete all Challenges in the Marathon Training Series and you can expect proper recognition of your efforts by Strava (and maybe a little surprise as well). You have to run 26.2 miles in a single run (just like you do at a marathon). There is an eight hour time limit to complete your 26.2 mile run. Manual entries or treadmill runs wil not count towards your Challenge effort. All activities logged during the Challenge period must be uploaded to Strava no later than 5/01/2013. Q: When do I have to complete the marathon? A: You can run 26.2 miles in a single run any day between April 6th-28th. Q: Can I run multiple times to add up to 26.2 miles? A: No, you have to run 26.2 miles in a single run (just like you do at a marathon). Q: Is there a time limit for the marathon/26.2 miles? A: Yes, there is an 8 hour time limit to complete the 26.2 miles. Q: Can I participate in this Challenge even if I have not completed the other Challenges in the Marathon Training Series? A: Yes, you can take part in as many of the individual Challenges as you like.